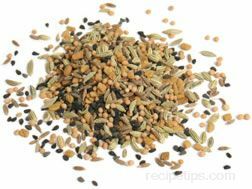 A traditional blend of seeds used to season foods for east Indian cooking. Panchpuran, which is also referred to as panch puran or panchphoran, is a blend of mustard seeds, cumin seeds (jeera), nigella seeds (kalonji or kalwqanji), fennel seeds, and fenugreek seeds. It is a seasoning commonly used in chutneys and vegetable dishes, as well as fish, poultry and meat dishes.